A week after traffic-stopping marches by teachers and their supporters, a group of parents who say they're "collateral damage" in the now six-day-old strike took to the street urging officials to end the stalemate. Parents gathered near the Chicago Teachers Union headquarters at the Merchandise Mart with a message: resources are exhausted and kids need to be back in school. "I'm very tired of having Karen Lewis, the head of the CTU, pretend to speak for parents and students. She does not. 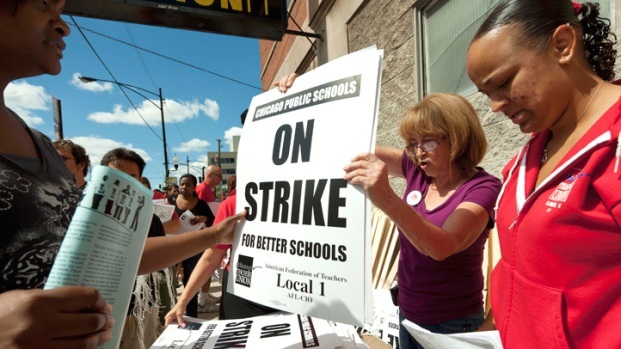 She represents her teacher union," said one frustrated parent. The small group marched and chanted while holding signs that read "If you care about the kids, go back to work" and "350,000 CPS Hostages! Let our children learn" and "Don't say you care, show it!" Mayor Rahm Emanuel contends strike is illegal because it's based on non-economic issues and because it presents a "clear and present danger to public health and safety." Mary Ann Ahern reports. A flyer announcing Monday's rally claimed students collectively miss out on roughly 2.6 million hours of learning each day teachers are on strike. Throughout the strike, one of the few alternatives for parents trying to hold down jobs of their own have been the nearly 150 "Children First" sites. Initially operating for four hours, school officials extended them late last week to six hours to better accommodate parental schedules. NBC Chicago has an array of reporters and producers covering the Chicago teacher strike. Check our live blog for continuous coverage and updates throughout the strike.